It was a little over two years ago that I heard Sir Colin Davis conduct the Berlioz Requiem in St Paul’s Cathedral; it was the last time I heard – or indeed saw – him conduct his beloved and loving London Symphony Orchestra. Irrespective of that hindsight, I found it at the time a magnificent, unforgettable performance, as indeed I wrote, or rather raved, at the time. Life goes on, however, even when it comes to requiem masses. This performance was perhaps never going to live up to the extraordinary nature of that occasion; not only was the greatest Berlioz conductor of all time delivering his valedictory thoughts on the piece, but for once, Wren’s cathedral proved a preferable venue. The Royal Festival Hall was anything but ideal; I could not help but wondering whether a trip, say, to Westminster Cathedral would not have been a good idea. (The problem was not simply a matter of the acoustic, as I shall try to argue below.) Those factors notwithstanding, however, this was in most respects an excellent performance, one which will have doubtless introduced a good few new listeners to this singular work. There was relief to be felt thereafter from the a cappella semi-chorus (actually much less than that: probably twenty voices or so) in the ‘Quaerens me’. It was possible to feel a connection with a much older choral tradition, even if the sense of Palestrina were more apparent than ‘real’. Especially memorable was the beautiful halo of sound at the conclusion: ‘Statuens in parte dextra’. The ‘Lacrymosa’ and ‘Domine, Jesu Christe’ have texts I find well-nigh impossible to dissociate from Mozart: my problem, I know. Or at least, it takes a performative wrench to have me forget that greatest of all Requiem settings. Here, Berlioz’s oddness came across strongly, not least the blazing conclusion to the first of the two movements. But it was only really in the second that the anxiety to what is after all an imprecations registered in duly personal – both compositional and theological – fashion. The ‘Hostias’ benefited from nicely snarling trombones, as well as markedly ‘white’ flutes – and, of course, excellent choral singing. As so often, the ‘Sanctus’ was marred by a tremulous tenor, Sébastien Droy, who was at times somewhat constricted too. A brightly ‘secular’ Hosanna fugue made its point – perhaps a little too strongly. However, the ‘Agnus Dei’ was very impressive, bringing due symmetry with the opening movement. Salonen’s control remained admirable, and there was again delectable menace to the trombones and, more generally, to the bass line. Finally, there came resolution of sorts, though I could not help thinking it more ‘musical’ then ‘theological’ – not so much because Berlioz cannot achieve the latter variety, a point which is at least arguable, but because the performance as a whole never truly engaged with theological issues in the first place. Having heard Pierre-Laurent Aimard play The Art of Fugue in this very hall a few years ago, I was, despite very mixed feelings concerning that performance, keen to hear this always interesting, ever-thoughtful artist in Book One of the pianist’s Old Testament. Again, my reactions were not uniform, but it would surely be a truly extraordinary performance – whether good or bad – in which they would be. A degree of the heavy-handedness I noted in 2008 manifested itself again, especially earlier on, and especially during the fugues, but it seemed to fade away, as did the state of affairs in which the earlier preludes tended in general to fare better than their companion fugues. Perhaps most importantly, there was a true sense, understated though it may have been, of progress, of a ‘journey’, to try to reclaim a word that has perhaps become clichéd beyond repair. Bach’s tonal cycle in the end amounted in performance to very much more than the sum of its parts, which parts I shall now attempt to summarise. The C major Prelude was, intriguingly (a nod to its clavecinist roots? ), slightly uneven: very different from the almost belligerent presentation of The Art of Fugue. There was a sense of expectancy in what was quite a slow account. Its fugue, by contrast, exhibited an unevenness that came across as a little unsteady; a little pedal would not necessarily have gone amiss here. The C minor Prelude came across in relatively ‘neutral’ fashion, which did not preclude a strong sense of harmonic motion. Aimard’s decidedly non legato approach to the C minor Fugue, however, wanted charm. Much more ingratiating was the C-sharp major Prelude, which also benefited from its prelude-predecessor’s sense of direction. Its companion fugue sounded ‘neutral’ in the positive way of apparently letting the music ‘speak for itself’, however much art may be required for such an impression to take hold. Moving to the tonic minor, there was struck a note of almost nostalgic sadness, harking park to the opening Prelude. There was a stronger sense than in earlier pieces of reimagining, not entirely unlike a more Teutonic Tombeau de Couperin. Rhetorical spreading of chords made their point without overstatement. After a short break to return to the dressing room to collect missing music, Aimard continued with a C-sharp minor Fugue of grave, though decidedly un-Romantic dignity. As often, though not always, in this recital, counterpoint rather than harmony proved the driving force. There was, however, an element of heavy-handedness towards the end, which somewhat marred the impressive earlier sentiment. D major brought a brisk, lively Prelude and a rather unyielding Fugue, which nevertheless, so long as one could take its underlying anti-Romanticism, had a strong stylistic sense of the Baroque Overture. D minor encouraged greater warmth, or at least less chilliness. There was a sense in the Prelude of a Bach edging at times harmonically toward the slightly surprising destination of a Schubert Lied. (Or at least, so there was in my aural response!) Oddly, the Fugue seemed a little lacking in the direction which was generally a strong suit for the pianist. Again, the E-flat major Prelude was relatively ‘objective’ in its presentation. Likewise its fugue, albeit with more than a nod to its slightly awkward – in the sense of character, that is – angularity. Moving to E-flat minor, Aimard confounded expectations. The Prelude unfolded in high-Romantic (or thereabouts) fashion: beautiful, profound, without a hint of self-regard; the Fugue continued in similar vein, with a stronger impression of ‘belonging’ to its Prelude than previous pairs had shown. The E major Prelude and Fugue, by contrast, were themselves nicely contrasted with each other. In the E minor Prelude, I could not help but think that greater legato would have assisted its progress. Aimard’s no-nonsense approach to its Fugue worked well, though, without shading into anonymity. Much the same – the no-nonsense bit – could fairly be said of the F major Prelude and Fugue. The F minor Prelude was taken surprisingly slowly – to its advantage, both in terms of the harmonic implications of Bach’s counterpoint, and yes, its pathos. Bach’s chromaticism in the F minor Fugue benefited in similar fashion: what a relief it was that it and he were given time to speak! After the interval, Aimard offered a playful yet muscular F-sharp major Prelude: an individual, though not eccentric, reading. The Fugue was more variegated than many of its predecessors, setting a note in general for this second half. It was rock solid, without that in any sense implying dullness. Aimard’s combination of harmonic direction and dynamic variegation was near-ideal in the F-sharp minor Prelude, after which the Fugue was presented in stark, almost desolate fashion, with more than a hint of the Passion settings, not least in the driving force of the continuo-like bass line. The G major pieces scintillated, the G minor Prelude registering all the more thereafter as labyrinthine, suggestive of Berg, though without less to its temporality. Its fugue was forthright, but this was a forthrightness with light and shade. A brisk A-flat major Fugue permitted a sense of broadening out for its Fugue, whilst the G-sharp minor Prelude and Fugue displayed a very well-judged combination of forward direction and chiaroscuro. The Prelude in particular gave an impression of dialogue such as one might more readily find in the Keyboard Suites – though not, of course, only there. A lively, alert A major Prelude, again with the requisite dynamism of development, led to a Fugue whose non legato style here registered as genuine, meaningful contrast, consonant with its character, rather than interpretative oddity. It almost flirted. I initially thought the A minor Prelude unyielding, and perhaps it was, but kinship with Mendelssohn was perhaps part of the payoff for that. The stark nature of Aimard’s performance of the A minor Fugue was less convincing, its clockwork style missing the piece’s beating heart. Was the B-flat major Prelude a little on the Czerny side? Perhaps, but there was no great harm in giving the fingers such a work-out; Bach’s genius still shone through. A very fast tempo for the Fugue, combined with sovereign technical command, had similar rewards, though something also seemed to be lost. Swiftly though it may have been taken, however, there was no less of depth to the B-flat minor Prelude, that greater second-half chiaroscuro aiding its passage. The Fugue, by contrast, was quite unhurried, its majesty permitted to unfold without fuss. It was not the most Romantic performance, but it was not anti-Romantic either. Pianistic subtlety, devoid of narcissism, enabled a performance of great distinction. After that, the B major Prelude came as light(-er) relief, with fine but not fussy attention to detail and direction. Likewise its Fugue. The B minor Prelude was taken in decidedly anti-Romantic fashion, not entirely to its benefit, the repeat of the first section coming across as charmless and heavy of hand. As indeed did quite a bit of what followed, although the repeat of the second section was considerably more yielding. So was the B minor Fugue, Bach at his most Bergian, for all that Aimard kept the music moving on in relatively swift fashion – at least until a big ritardando at the close. The long silence of communion at the end told its own tale. ‘Vienna Revisited’ has been the title of Kings Place’s mini-festival, ‘curated’ by Nicholas Snowman. I managed to attend two out of the four concerts, missing the Quatuor Diotima (Beethoven, Schoenberg, and Brahms) and the Aurora Orchestra (Webern, Berg, and Mahler). First up was an intriguing performance of Verklärte Nacht by six members of the London Sinfonietta (Clio Gould, Joan Atherton, Paul Silverthorne, Yuko Inoue, Tim Gill, and Jonathan Ayling), a performance which once again confirmed the superiority of Schoenberg’s original sextet version over its later orchestral incarnation. I say ‘intriguing’, since, especially for the sextet version, the spectre of Brahms was far less present than one might have expected, Wagner instead proving more a guiding force in a highly dramatic account, which might almost have been an operatic scene without words. One also had a very strong sense of six individual musicians – coming together, yes, but also with particular things to say. The veiled opening signalled, at least in retrospect, a dramatic ‘extreme’, for wonderfully expressive – not indiscriminate – vibrato was to come. Expressionism beckoned too. Without going to any perversely anti-Romantic extreme, there was great clarity; in some respects, I was put in mind of a Domaine musical recording, supervised by Boulez. Sections were clearly demarcated; one would not always want to hear it like this, but there was a stronger than usual sense both of the poem and almost of something akin to versicle and response. It was almost as if one were reading an illustrated short story. There was moreover, a strong impression given of the character – and meaning – of particular keys and their relationship to one another. An unfortunate instance of electronic interference, just before the final transfiguration, could not disrupt a fine performance. Sarah Connolly joined a larger Sinfonietta ensemble under Nicholas Collon for the chamber version of the ‘Lied der Waldtaube’ from Gurrelieder. Connolly as soloist offered a wonderful range of colour and expression, her use of words just as impressive as her command of vocal line. Increasing richness of tone marked hers out very much as the ‘mittlere Stimme’ Schoenberg prescribes – even if I continue to love the recording Jessye Norman made with Boulez and the Ensemble Intercontemporain. After a somewhat wayward cor anglais opening line, the orchestra imparted an excellent sense of the febrile quality to this reduced instrumentation, although Collon’s conducting was somewhat fussy, stronger on the paradoxical clockwork element than the equally important late-Romantic profusion. Collon fared better in the First Chamber Symphony, though the very fast tempo adopted at the beginning – whatever Schoenberg may have prescribed – perhaps proved self-defeating, and I could not help but wish for this, perhaps the sunniest of Schoenberg’s inspirations, to have smiled, Haydn-like, a little more. Expertly performed by old hands, this account was not inflexible, but sometimes a little too moulded by the conductor, at least for my taste. Still, there was incredible virtuosity to be heard, great clarity, and a fine blend of lines, all despatched with an impressive sense of kinetic energy. The other, short concert I attended two days later, was given by soprano, Alice Privett and pianist, Chad Vindin, with a brief appearance from members of the Aurora Orchestra (Rebecca Larsen, Chris Deacon, and Sarah Mason). Berg’s Seven Early Songs came first. ‘Nacht’ displayed from the outset excellent diction. A slightly deliberate tempo worked very well, permitting detail and decadence alike to tell. And those harmonies, threatening to float, Jakobsleiter-like, into the ether! The paradoxical sense of convivial Einsamkeit was very well conveyed. ‘Schilflied’ struck a lighter note, without losing expressivity; we heard here Berg as heir to Liszt and Wolf. ‘Die Nachtigall’ was passionate, if perhaps a little strident. I wondered whether ‘Traumgekrönt’ might have been a little less deliberate, but it benefited from Vindin’s strong sense of the labyrinthine tendencies, even at this stage, to Berg’s harmonies. ‘Im Zimmer’ showed keen attention from soprano and pianist alike to the shifting moods and registers of the poem, for instance to the crackling fireplace, as well as the music ‘itself’. ‘Liebesode’ was grand, even grandiloquent, as arguably befits the poem, whilst the final ‘Sommertage’, if again a little strident in the vocal line, had a fine sense of the song as a whole. Schoenberg’s Cabaret Songs followed. ‘Der genügsame Liebhaber’ immediately displayed a different mood: more playful, even ‘acted’, in short that of cabaret. Perhaps the piano was a little more reticent than it might have been, but that would not be a problem in subsequent songs. The mock stridency of ‘Einfältiges Lied’ was captured well by both artists, pictorial elements in the piano part coming across with admirable clarity. ‘Nachtwandler’ had the Aurora musicians join in. Those Musikanten, as the text would have them, did not always blend together so well as they might, but it is a tricky thing to walk on and perform for a single song. The real disintegrative tendencies to what might seem on the surface a simple song received fine, commendably flexible attention in the piano part. ‘Jedem das Seine’ was then taken more slowly, more reflectively than usual: more Romantic Lied, less evident cabaret, after which ‘Mahnung’ registered with proper Brettl-archness. (Weimar culture did not come from nowhere.) A nicely coquettish account of ‘Gigerlette’ , a lively ‘Galathea’ (with a lightly post-Tristan fourth stanza), followed. Although there were a few slips in the final ‘Aus dem Spiegel von Arkadien’, this remained an impressive recital throughout. 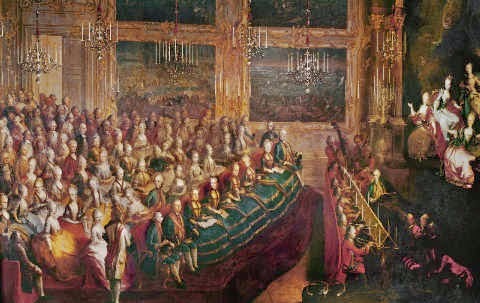 Painting of the premiere of Il Parnaso confuso, attributed to Johann Franz Greipel. The Archduke Leopold may be seen at the harpsichord in the pit, his sisters on stage. The response, or rather lack thereof, of London's ‘major’ opera companies to the Gluck anniversary has been nothing short of a disgrace. It would not matter, if they deigned to perform his operas the rest of the time, but they might at least have made token amends this year: instead, absolute silence has reigned, whilst the more artistically pressing business of endless revivals of uninteresting stagings of still more uninteresting works by Verdi and Donizetti has continued apace. After all, a season without a surfeit of Traviatas is no season at all for some houses; it is as if Gluck’s reforms, let alone Wagner’s, had never happened. Bampton Classical Opera, however, has performed a real service, in mounting the first British staged performances – at least that is the claim, and I have found no evidence to the contrary – of Il Parnaso confuso. Performances, especially in this country, of Gluck’s reform operas are so thin on the ground that it seems an almost indecent luxury to see one of his other works. It should not, however, and such works require no apology, simply a hearty welcome – and of course good performances. This one-act festa teatrale, here performed in tandem with Bertoni’s Orfeo (on which more anon), was composed to a libretto by Metastasio, for performance at Schönbrunn in 1765. For the marriage of the Archduke Joseph, shortly to be Joseph II, Holy Roman Emperor, to Maria Josepha of Bavaria, Gluck was commanded to write no fewer than three works, the others being a full-scale opera, Telemaco, ossia L’isola di Circe, and a pantomime-ballet, Sémiramis. (If we think his operas neglected, just consider the fate of his ballets, with the partial exception of Don Juan.) The concept of Il Parnaso confuso was that it would be a surprise for the wedded couple, performed by four of Joseph’s sisters and directed from the harpsichord by his brother, Leopold. Were this Strauss and Hoffmansthal we should doubtless all be hymning the metatheatricality of a work in which four of the Muses are suddenly called upon by Apollo to provide an entertainment for Joseph and his ‘stella bavaria’ and hasten to do so, only to find out that the wedding has already taken places and that their services are required not very soon but immediately. Indeed, there are more than shades avant la lettre of Ariadne auf Naxos. (Strauss, far from incidentally, was a great devotee of Gluck’s operas.) That the libretto is by Metastasio, and mocks as old-fashioned and merely conventional earlier Gluck works, written for Joseph’s first marriage in 1752, offers irony aplenty, especially when one considers the shortly-to-be-penned Preface to Alceste, in which the Caesarian Court Poet would find the reformist boot very much on the other foot. Both Gluck and Metastasio show a light, even comedic touch that confounds such expectations as we might generally have today. Performances did this work – perhaps slight, but far from negligible – proud. Thomas Blunt showed a true, and rare, sense of eighteenth-century style, which is certainly not what many people nowadays think it to be. Tempi were well chosen, orchestral colour within its bounds well balanced, and the singers well supported. The musicians of CHROMA are of course equally to be credited; small numbers notwithstanding, the band, placed behind the stage, never sounded meagre, the acoustic of St John’s Smith Square doubtless proving of considerable assistance. Jeremy Gray’s production offered an Alpine Parnassus, replete with Dirndl, Lederhosen, and beer, which allowed the action – and above all, the music – to proceed without unnecessary interference and yet which, at the same time, provided a witty framing for further metatheatrical reflection, should one have wished to indulge. (The question of Gluck and ‘nationality’ is complex and fascinating.) All of the singers had a good deal to offer, Gwawr Edwards being perhaps my pick of the bunch, the surprisingly difficult technical demands – how did the princesses cope with them? – having little fear for her, but never being a mere end in themselves. She and her sisters, played by Anna Starushkeych and Caryl Hughes distinguished well between their respective roles, without attempting unduly anachronistic ‘characterisation’ in the modern sense. Aoife O’Sullivan’s Apollo sounded perhaps a little strained at times, but otherwise impressed. The passage from opera seria to ‘reformism’ was neither linear nor uniform, as both the ‘reform operas’ and chronology will attest. Il Parnaso confuso was composed after Orfeo, though I should defy anyone to guess so. Moreover, just as Metastasio’s libretti would be set by a multitude of composers – Mozart had at least forty predecessors, Gluck included, when it came to La clemenza di Tito – Gluck was not the only composer for Ranieri de’ Calzabigi’s Orfeo. Here we heard what was intriguingly billed as the first ‘modern-times’ performance of Ferdinando Bertoni’s 1776 version in the United Kingdom; I can only assume that there must therefore have been an eighteenth-century performance somewhere in this country, and should be grateful for confirmation and details. Doubtless the strangeness would have been greater had we not heard the work in English translation, but even so, it is a slightly odd business hearing a text – even when cut – one knows so well, set to different, yet clearly ‘influenced’ music. The impression is generally of pleasant, perhaps more ‘up-to-date’ music, somewhere between imitation Gluck and Johann Christian Bach, but deeper acquaintance might possibly ascertain greater individuality (or not). It is well-crafted and certainly to be preferred to many of those aforementioned undistinguished nineteenth-century works our houses continue to foist upon us. An exception seemed to be offered by certain odd tonal jumps in the recitatives; without consulting a score, I cannot say whether that was Bertoni’s fault, or a matter of the performing edition. Maybe it would have been too much to hear both Orfeo settings back to back, but it would have been intriguing: an idea for another occasion, perhaps? Again, performances were generally impressive. Blunt, clearly a force to be reckoned with, and someone from whom I hope to hear more soon, again led his players in a stylish, committed performance, which enabled parallels with as well as distinctions from Gluck to be drawn. Gray’s modern-dress production again permitted the work to progress without fuss. The lion’s share of the singing is Orfeo’s; here, Anna Starushkeych was a little more variable, perhaps a little tired at times, but nevertheless gave a good sense of what was at stake. Thomas Herford and Aoife O’Sullivan provided very good support, as did the small soloists’ chorus. Charles Burney’s doubts concerning Bertoni’s inventiveness may have been justified, but so, for the most part, was his discernment of a style that was ‘natural, correct, and judicious; often pleasing, and sometimes happy,’ both in work and here in performance. Whilst, even in this, one of the strongest of Handel’s operas, it is difficult and would probably be perverse to care about the characters and their actions in the way one would in the greatest of his dramatic oratorios, let alone in an opera by Monteverdi or Mozart, the cast offered not only a generally strong set of vocal performances but, for the most part, more than plausible acting too. Alice Coote seemed to be an audience favourite but, for me, hers was a strikingly mixed performance: at its best very good, especially rich in the lower range, but too often resorting to downright shouting, and with decidedly mixed results when it came to coloratura. Andrew Watts’s coloratura was often found wanting too; I had the sense that he would have been happier in contemporary than Baroque opera. Otherwise, there was little about which to cavil at all. Sarah Tynan’s Romilda was beautifully sung throughout, with a fine sense indeed of how coloratura can, even in Handel opera, strain towards true dramatic meaning. Rhian Lois captured to a tee the character of her scheming yet ultimately insouciant sister, Atalanta, and was just as impressive in vocal terms. Catherine Young offered relative gravity and, again, equally excellent singing as the disguised heiress, Amastre (Amastris here). Neal Davies and Adrian Powter were more than serviceable in the smaller roles of Ariodate and Elviro. Direction of the chorus was finely judged too. I feared the worst at the beginning of Michael Hofstetter’s account of the Overture. Vibrato-less strings and a hard-driven tempo had me thinking we should be in for something akin to typical English ‘Baroque’ – actually, nothing of the sort – puritanism. However, within the bounds of what is (sadly) nowadays possible, Hofstetter’s conducting and the ENO Orchestra’s response showed considerably flexibility and an enlightened approach towards musical expression of which I had more or less given up hope. There was not, of course, the rich tone of the old ‘live’ recording (in German) from Rafael Kubelík, with Fritz Wunderlich no less, but the performance compared well with Charles Mackerras (this production, on DVD). Not only was there genuine ‘life’ to be heard in the pit, it sounded like an orchestra rather than a tired end-of-pier band, such as more recently suffered here from so-called ‘specialists’. This work’s particular fluidity of recitative and aria – perhaps harking back to one of Handel’s sources in Cavalli’s version? – was well served, dramatic impetus not, at least after the Overture, being mistaken for the tyranny of the bandmaster. If there were times when a little more warmth would not have gone amiss from the strings, they were fewer than one might have expected. Continuo playing was alert and, again, far from inflexible. ENO could do far worse than ask Hofstetter back in such repertoire – especially when one considers the alternatives. There will be a broadcast on BBC Radio 3, on 4 October. This was a fascinatingly programmed recital, which proved to be more than the sum of its considerable parts. Debussy’s Etudes bookended two Birtwistle works, both splendidly original and full of ‘traditional’ resonance, with Busoni reimagining Mozart (partly, like Birtwistle, reimagining Bach) at the centre. Nicolas Hodges’s interpretations played to and upon the programming, drawing out – and enabling the listener to draw out – connections, rather than presenting ready-made ‘individual’ performances. And, of course, there was the small matter of a Birtwistle premiere in his eightieth birthday year. The first six Debussy pieces opened with a stark, elemental ‘pour les “cinq doigts”’, its simplicity almost aggressive. Uncertainty invaded, preparing a typical dialectic between opposing yet related tendencies. There was great clarity to Hodges’s performance; this was forthright, even high modernist, Debussy. ‘Pour les tierces’ put the interval in question in the foreground from the outset, permitting elaboration, variation, something akin to discussion. Harmonies, if some way still from the non-functional, were readily apparent as constructions from intervallic material: an obvious contrast with, say, many of the composer’s Préludes. Such was not, of course, always the case; indeed, contest was in good part the thing. The importance of intervals, at any rate, reminded one that Webern was far from the only begetter of Boulez and the post-war avant garde. And then, the third study seemed to take in more of the world of those far-from-superseded Préludes: Debussy – and a good performer – will always question, even confound. Mediæval resonances of the fourth, organum in particular, made their point without a hint of the archaic. In ‘pour les octaves’, Post-Lisztian pyrotechnics combined with modernistic insistence, even at times, glare, seemingly born of the first study, whilst ‘pour les huit doigts’ seemed to take its leave from that first piece’s dexterous explorations: post-Czerny, as it were, though with Liszt not so far away either. Birtwistle’s Variations from the Golden Mountain – ‘I’ve been listening to Bach’s Goldberg Variations a lot recently; I thought it was obvious.’ – received its first performance, commissioned by the Wigmore Hall, with the support of André Hoffmann. It was inevitable, doubtless, but still striking how much the ear found, and was led to find, points of connection with Debussy at perhaps his most ‘abstract’. A generally and, for the composer, unusually slow tempo, following a toccata-like opening flourish, made no difference to the typical yet typically unique senses of mechanism and of its progress and halting. Perhaps that tempo, as well as the instrument, enabled more of a post-Webern pointillistic impression than one often gains from Birtwistle, at least at times. Stockhausen occasionally came to mind in that respect too. There was always, though, a longer, melancholic line, as well as typical outbursts of almost Schoenbergian (op.11) violence, Hodges drawing out mightily impressive sonority from the bass of his instrument. The second half opened with Busoni’s reworking of Mozart’s extraordinary Schoenbergian Gigue, KV 574 and the fandango – which, for some reason, Busoni dubbed a bolero – from the third-act finale to The Marriage of Figaro. The first gigue section was taken very fast indeed, anything but ‘Romantic’; indeed, it emerged as very much in keeping with what we had heard in the first half. The ‘bolero’ offered relative, but only relative, relaxation, still very much in constructivist, even Bauhaus, mode: most intriguingly so in its Klemperer-on-speed Sachlichkeit. The final ‘variation’ of the gigue material offered an ambiguous, ambivalent response to some of the Lisztian tendencies announced by Debussy. It seemed all over in a flash, leaving one wishing for more – not unreasonably so, in the case of the ever-neglected Busoni. The 2011 Gigue Machine is, according to the composer, a ‘fantasia in two parts’, its counterpoint ‘linear and sonorous against something else that is very staccato’. To my ears, it sounded, both as work and performance, closer to Stravinsky than Variations from the Golden Mountain, but also in context drew upon the example of Mozart’s – and Mozart-Busoni’s – Gigue as well as Bach. Harmonies, again probably partly as a well-nigh unavoidable consequence of pianistic tradition, sometimes suggested German music from Bach to Schoenberg. And of course, there were the wonderful, machine-like ostinatos so typical and, again, so individual in their reinvention. Then came the remaining six Debussy Etudes. The seventh sounded as a whirlwind, within which a diatonic heart was permitted, encouraged, or enabled to beat. ‘Pour les agréments’ was, quite properly, more yielding, even charming. Debussy’s famed ambiguity came to the fore once again, though there was nothing remotely fuzzy to Hodges’s pianism. Virtuosity was still required – and received. Likewise in ‘pour les notes répétées’, though I wondered whether we might have heard more at the softer end of the dynamic range. Musical process was at any rate abundantly clear and meaningful. The sphinx-like Debussy came once again before our ears in ‘pour les sonorités opposées’, wonder on show at the exploration of harmonies – and pianistic harmonies at that. Ghosts of Tristan occasionally made themselves heard, but so did premonitions of so much of what was to come later in the twentieth century. A note of whimsy was struck in the eleventh study, albeit underpinned by something wordlessly deeper. Beguiling tone and a willingness always to yield were crucial here. ‘Pour les accords’ was duly climactic, Debussy’s knowingly cruel demands seeming very much to form as well the material as well as to bind apparently disparate earlier tendencies together. As an encore, and with a nod to Birtwistle’s initial intention to call Gigue Machine ‘Bunch of Bagatelles’, we heard Beethoven’s op.126 no.3, structure and apparent simplicity very much to the fore, without precluding sentiment or fantasy. The first movement, then, sounded rather like Gilbert heard Bernstein described it, save for the fact that it was not very nightmarish. The Gewandhaus Orchestra played with greatly impressive attack, but seemed encouraged to sound brasher than usual, almost as if it were being asked to ape Gilbert’s – or Bernstein’s – New York Philharmonic. What was entirely lacking here was the formal inevitability – form should be understood in dynamic, not static, terms – one hears or has heard from conductors as different as Abbado, Boulez, Haitink, Horenstein, or indeed Bernstein. (I could have done without the Big Bird-style conducting gestures too; at one stage, I thought Gilbert was about to launch into flight. O for the elegance, the economy of the first three named of alternative conductors!) At least there was, for much of the movement, a strong sense of rhythm, even if its connection with harmony appeared to elude the conductor. That dissipated, however, with some unconvincing rubato and tempo changes later on, signalling instability in very much the wrong sense. Doubtless this will all be lauded as ‘exciting’ in some quarters, but without structural command, the excellence of the orchestral playing could not make a symphony out of what sounded more akin to a very lengthy suite. The rush to the finish, however, well executed by the players, was straightforwardly vulgar – as opposed to harnessing apparent vulgarity to higher ends. The second movement strayed closer still to Simon Rattle territory (or rather recent Rattle territory). Necessary lilt soon became unduly moulded, variations in tempo excessive. Some material was taken very fast indeed, to the extent that it sounded almost balletic. Mahler as Delibes? A point of view, I suppose, but that is the best that can be said. The third movement veered weirdly between such ‘balletic’ tendencies and imitation Bernstein ‘house of horrors’, which would have been better left for the Seventh Symphony. The problem, really, was that they arose from nowhere, and that the whole movement was more than a little rushed. At least the post-horn solos were played beautifully – as indeed was everything else. Finally, the great Adagio - well, strictly speaking, Langsam - which came off surprisingly well. At least some of the time, it appeared to speak ‘for itself’. The Leipzig strings were wonderfully warm in tone, with the necessary depth to let Mahler’s harmony tell. Although it was not always as rhythmically solid as it might have been, the performance was a definite improvement upon most of what had gone before. And the sound of this great orchestra remained a wonder in itself. Unlike many such occasions, this concert actually did take place on the composer’s birthday, albeit banished to a ‘late-night’ slot. I wish I could feel greater enthusiasm for the more recent works of Sir Peter Maxwell Davies, at least taken as a whole. Too often, especially during the Fourth Strathclyde Concerto, I was left hankering for something of the violence of Eight Songs for a Mad King, of Taverner, or of Worldes Blis. (When, I wonder, shall we hear the latter again? Or, in my case, hear it for the first time in concert?) One would not, of course, expect any composer to stay the same throughout his career, and it is perfectly understandable that Davies should consider such works those of an ‘angry young man’ and feel the need to do something different. At any rate, it was good to have the opportunity to hear three works of his which I had never heard ‘live’ before. Ebb of Winter was written last year, commissioned by the Scottish Chamber Orchestra for its fortieth anniversary. I found it the most compelling of the three pieces performed here, having the scale and ambition of a true tone poem. The opening calls from horns are – and, in performance were – arresting. Within a minute or so, one hears them, all almost jazzy syncopation, something more ‘involved’ in a Schoenbergian sense, and the ‘Scottish’ rhythms of the Scotch snap: material and moods aplenty, then, for development, and it is that which most impresses. Trumpets seemed to offer a reminiscence of the frenetic world of The Lighthouse. A stentorian chorale made its mark, both uncertain and certain; so did delicate woodwind solos. The depth of orchestral sound from the SCO under Ben Gurnon belied the relatively modest forces. The fourth of Davies’s ten Strathclyde Concertos followed, Dmitri Ashkenazy joining the orchestra. Again, the performance seemed beyond reproach, and there could be no gainsaying the composer’s command of line. Ultimately, however, what one might call its ‘meditative’ quality proved a little monotonous – and grey – for me. That is not to say that there were not interesting moments. Following the brief introductory Lento, the second section, Allegro moderato, sounded almost like whimsical Brahms, the example – at least to my ears – of Schoenberg again apparent, if somewhat tamed. (It was the First Chamber Symphony that sprang to mind, albeit with thinned-out texture.) ‘Scottish’ rhythms again were to be heard. The following Adagio was gentle, unassuming, but a bit of an endurance test. That said, a discernible thread continued to be heard, so my disappointment may simply be a matter of taste and/or mood. (It was quite late in the evening by this stage!) The marimba, however, offered some sense of relief. Ashkenazy’s account of the cadenza clearly had its measure, preparing the way for a simple, folk-like melody to emerge, the final section proving numinous, even moving. The frankly pictorial An Orkney Wedding, with Sunrise followed, the SCO players clearly enjoying themselves, some of them – and the composer, onstage, with Tom Service – being offered a drink of celebration during the performance. There was characterful, at times boisterous playing: just as it should be. The descent into the darkest hours of night was expertly handled, both by the orchestra and by Gurnon. Those more enthused than I by the sound of bagpipes will have loved what came next; the instrument made its point, even as I wondered whether Scottish independence might not be so bad a thing after all. An arrangement of Happy Birthday, apparently made by one of the SCO’s players, rounded off the evening. Sadly, one of the most striking things about this concert was the small attendance. I should have assumed that a major American orchestra, with a renowned if not necessarily universally lauded conductor, playing a programme of mostly Brahms would have sold out, or near enough. Prom 69 actually proved to be the most sparsely attended of any of the ‘mainstream’ – that is, at the Albert Hall, and not ‘late night’ – Proms I have been to this season. Quite why, I am not at all sure; it is not as if we are overburdened with opportunities to hear the Cleveland Orchestra. It was my first such opportunity, and I was very glad to do so, for whatever the disappointments of Franz Welser-Möst’s conducting, it remained a privilege to hear the orchestra itself. A movement as a state of being, and a state of being as movement: an apparently contradictory pair, just like the title of the poem, Teufel Amor. Love however contains more contradictions than anything else in the world, epitomising the extremes of heaven and hell, pleasure and suffering, paradise and snake-pit. Whoever has been touched by the arrow of love is at the same time a human wounded by an arrow. My imagination was fired by Schiller’s fragment; his conception of the flight of Amor as the heights and depths of a melodic progression inspired me to compose a symphonic hymnos which praises the marvels of love – even in its devilish incarnation. What Paul Griffiths, in his programme note, described as an ‘abyssal darkness of love … [with which] the work begins,’ sounded, with its pointillistic low brass and woodwind, as if Wagner were refracted through Webern. Gradually, we discerned a thematic cauldron, scenting a musical brew with a definite sense of the Teufel, even of Hölle. Eerie ghosts of an expressionist past – this was surely inconceivable without Schoenberg’s Five Orchestral Pieces – announced themselves, as did Strauss and Mahler in the hymn-music. Fragments strained hard toward, sometimes attained, a fragile (late Romantic?) wholeness. Long violin lines – expertly played – seemed both to aid and call that into question, even before the advent of a waltzing phantasmagoria. Mahler seemed ever more prominent, in the pathos of individual lines (Joshua Smith’s flute in particular) and indeed in the harmony. It occurred to me that this was a work that would go very well with Mahler’s Tenth Symphony. There was much, which, taken out of context, might have been thought ‘late Romantic’ or ‘early modernist’, but context, of course was crucial. Material no longer means the same thing – and this was clearly part of the pathos, even perhaps Widmann’s tragic intent. Brahms, alas, fared less well, especially in the Tragic Overture, which Welser-Möst managed both to drive hard and to have sound well-nigh interminable. (It has always struck me as one of Brahms’s most succinct pieces.) The extent of that driving would surely have made George Szell blanch, but it was also quite without Szell’s sense of purpose. The Cleveland sound, however, was wonderful: dark, rich, finely articulated. At its best, the performance evinced a certain turbulence, redolent perhaps of some of the composer’s piano pieces; at its worst, it was merely harried. That is, until torpor set in. There was a sad lack of coherence, even on what appeared to be Welser-Möst’s own terms. The Second Symphony opened more promisingly. Its first movement was certainly not unduly driven, but tempo fluctuations were far from entirely convincing. Again, it was well played – beautiful woodwind detail in particular – but proved interpretatively faceless, save for genuine strength in the cross-rhythms. Brahms’s ‘geniality’ nevertheless seemed all too unalloyed, untroubled by the dark shadows that make this symphony what it is. The slow movement was taken at a perfectly reasonable tempo considered in abstraction, but Welser-Möst’s over-conducting made for a pedantic impression. One heard far too many bar-lines, even beats and their sub-divisions. It soon faded into generic listlessness. The third movement was the most successful of the four. On the fast side, very much so, it was nevertheless made to work. Playing was well-pointed; detail was apparent without obscuring the greater picture. The finale, alas, succumbed again to the strange temptation to drive too hard, too inflexibly. There was, perhaps more damagingly still, little sense of what connected the four movements; it was as if Brahms had composed a suite rather than a symphony. The First Hungarian Dance was offered as an encore: again, excellently played, but Welser-Möst’s rubato proved laboured in the extreme.